MUMBAI: India is going to be the toast on the second day of the Cable & Satellite Broadcasting Association of Asia's (Casbaa) conference which commenced in Hong Kong on 25 October. 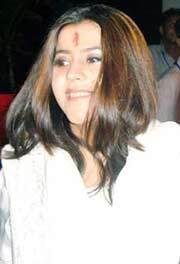 India's Soap Queen Ekta Kapoor is billed to be one of the two keynote speakers at the Casbaa's India Forum which is to take place at the HK Academy of Performing Arts post-lunch on 26 October. Kapoor, who took a flight to Hong Kong this evening along with Star India Network senior creative director Shailja Kejriwal, is expected to elaborate on what content works on television in India and why. She is also slated to speak about what makes Balaji and its soaps tick. Speaking to indiantelevision.com Kapoor said: "The major reason for Balaji Telefilms' success is the fact that our dailies and weeklies are about India - the real India. We take ethnic stories from middle class and mass India and we put them on air in a spruced up manner. We at Balaji understand the Indian ethos and we continuously strive to connect with our viewers. All the time - it is a religion with us to respond to our viewers feedback." The other keynote speaker who will follow through in the post-tea break session is HSBC Securities managing director, global sector head of media and entertainment Sandeep Pahwa. Pahwa will be elaborating on the fact that India's television market is burgeoning but there are impediments which may be hampering its growth. And also what is needed to build value in the media play on the Indian bourses. The Casbaa India Forum, sponsored by Star, will deal with three major tracks covering television --- kids TV entertainment, television software exports and direct to home television. The first session is slated to expand on the Indian kids channel market, which has been brimming with activity these days, with the players looking to grab a larger share of kids' eyeballs. The panel comprises of Walt Disney Television International (India) managing director Rajat Jain, Turner International (India) managing director Anshuman Misra and Nick VP & GM Hema Govindan. The second session will focus on whether India's rapidly growing TV production sector can make a mark globally - through format licensing or syndication or through distribution of whole channels to cater to the entertainment needs of the Indian and south Asian diaspora. And whether the traditional model of advertising-supported television content will continue to make sense in a rapidly evolving broadcast landscape. The high-profile panelists include Star India COO Sameer Nair and UTV chairman & CEO Ronnie Screwvala. The Indian DTH market is waiting to explode and in this context, the final session on DTH acquires immense significance. Space TV CEO Vikram Kaushik, Discovery Networks India managing director Deepak Shourie and Siticable head Jagjit Singh Kohli and Hathway Cable managing director & CEO K Jayraman will be sharing their views on what is expected to be a new frontier for television in India. The India forum will be hosted by ABC south Asia correspondent Geoff Thompson. Trai advisor (B&CS) Rakesh Kacker is the sole Indian government representative who will be marking his presence in the morning session on regulation along with Hong Kong Industry and Technology bureau Commerce principal assistant secretary Eddie Cheung.